The house located at 211 Wilson Street is positioned on Lots 15 and 16 of the Margaret Place Subdivision and actually faces Grove Street. Although commonly referred to as the "Noble Home", the original owner of the first structure was A.J. Vicellio who, as it appears, built the cottage circa 1920. In 1936, Charles Noble acquired the cottage and the vacant adjacent lot. He constructed the first addition to the home in 1939. 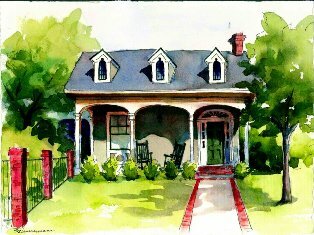 The house was later expanded again and a garage and screened porch were added by the Nobles. The garage and screen porch are now the present day kitchen and family room of the home. In 1995, John Miller purchased the house and built a shop behind the existing carport and caretaker's cottage. Mr. Miller, who's hobbies included woodworking, built the arched columns on the current screened in patio to mimic the arched columns on the front facade of the home. In 2002, the property was sold to Vicki and Paul Shearman. 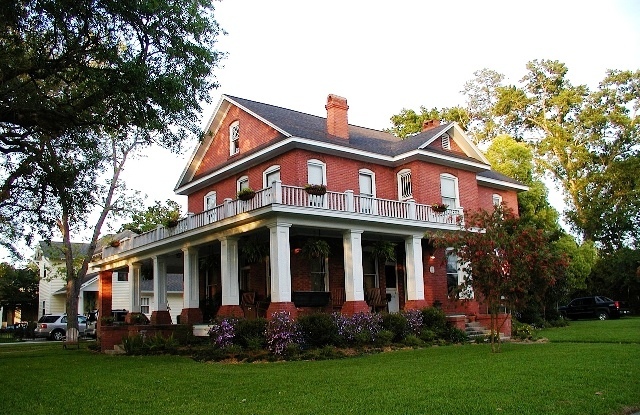 In 2005, just days before Hurricane Katrina struck New Orleans, the current owners, Kathryn (formally Quinn) and Tom Filo purchased the home from Paul Shearman. 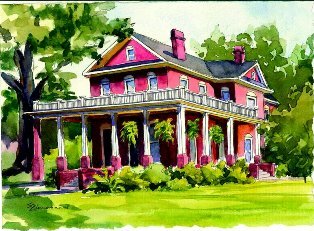 The Filos had not yet begun renovations to the house when Hurricane Rita struck Lake Charles in late September of 2005. Tom's oldest son Taylor and his wife Mary Anne moved into the house after their home on Earnest Street was extensively damaged in the hurricane. Taylor's oldest daughter Emily spent her first year in the house while planned renovations to the home proceeded. The extensive renovations made to the house in 2006 included taking in attic space for a second story playroom and half bath, installing a staircase, building a brand new master suite in place of the former kitchen and dining room and moving the kitchen to the lower portion of the house where the old garage was located. The Filos also built an outdoor fireplace and grilling area on the screened patio, and extensively renovated the old "shop" outside to convert to a game room and storage. During renovation, the Filos discovered many quirky characteristics about the home. For example, every door on the interior of the house, including pocket doors, could be locked from both the inside and outside. Where the kitchen pantry is currently located, there was an old boiler that had been converted into a concrete and brick interior planter. While during the attic renovation, a photography darkroom was found which is why the half bath was constructed. The Filos wanted to keep the integrity and architectural style of the home while renovating. Most of the interior doors are original as well as the exposed brick wall in the current kitchen. The hardwood floors throughout the front of the house are all original and have been refurbished. In early 2007, shortly after the birth of their second child John, Tom and Kathryn moved into the house at 211 Wilson Street. The house is now a 4 bedroom and 2 half bath home with approximately 3,900 square feet of living space. Tom and Kathryn live in the "Noble Home" with their two children Sarah (8) and John (5), both attend Immaculate Conception Cathedral School across the street. Both Miller and Filo owned homes in Margaret Place prior to their current residence. Built by attorney Cullen Liskow and wife, Katherine Brainard West Liskow, this is in an English Tudor cottage style home was designed by R. S. McCook of the St Louis firm Asmus, Clark and McCook. The contractor was Walter James Patrick. Exterior features include a slate room and cypress was used for all the wood trim. In 1974, then owners Shirley and Bain D. Slack re-did the stucco in all the rooms. They had Jude Benoit, architect, design and add a 1,000 square foot family room onto the back of the house in the 1980’s. The house is one of six properties designated as a Landmark Home by the Preservation Society in 1990. The home is now owned by Elizabeth and Darren Matel. In a turnabout from a more conventional sequence of events, the William Henry Managan House at 220 Wilson Street, was “handed-down” from son to father – as a result of a fire. That little footnote to history was revealed in research by the current owners, Mr. and Mrs. Lastie Paul Vincent. 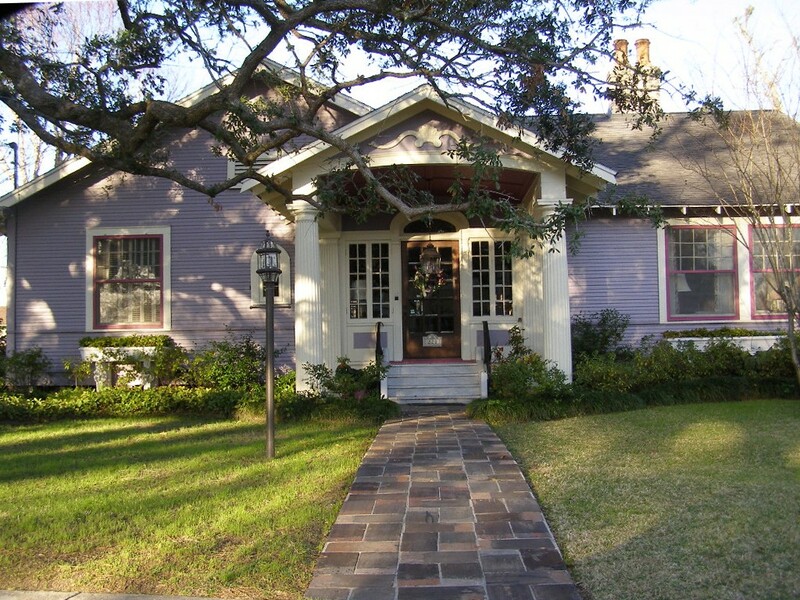 The original cottage was built in 1920 by a young Managan – the bachelor son of a family well established in the lumber business – in Margaret Place, the Lake Areas' first "Streetcar Subdivision." In the late 1920’s, the Westlake residence of the Managan’s parents was destroyed by fire while they were at their Calcasieu (Big) Lake summer home. Improvements included a master bedroom and bath complete with dressing areas, a solarium, a library and a covered walk to a double garage with servant’s quarters overhead. Especially significant are wood carvings, depicting the Cascade Mountains of Washington, which frame all four walls of the library. The home, including the solarium which may be used as a greenhouse, is heated by a still operable steam system. The library, dining, living rooms and master bedroom feature antique ceiling fans dating from the early part of the century. An ornate walkway leads to guest quarters and the utility and garage areas. An elaborate fish pond in the backyard was covered when the house was purchased by its previous owners in 1981. They felt the pond was hazardous to small children. The senior Managans occupied the house until their deaths in 1946, at which time their son, the original owner, and his wife returned to the house. He died in 1974 and his wife Frances, well known throughout the area as a musician and piano teacher, remained there until 1981. She died in 1989. 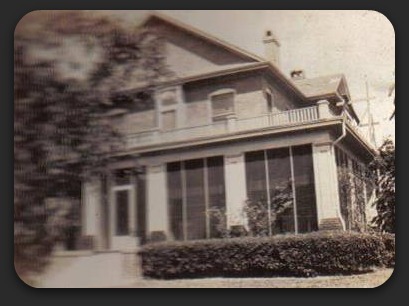 This home, known as “Maison Rouge,” was the first home built in Margaret Place circa 1912. The original homeowners/builders were Leon Locke and Francis E. King and the current caretakers are Jim and Theresa Barnatt. Leon’s paternal ancestors came to America in 1632 and located in New England. Some of the Mr. Locke’s paternal ancestors were with the Colonists who met the British on Lexington Commons and harassed their retreat. Mr. Locke’s mother was a descendant of Nathaniel Seegar, a Maine pioneer and patriot, who was captured by the Indians and escaped with a companion. This was a thrilling episode in the history of the Maine settlements when they were a part of the parent Colony of Massachusetts. Leon was born in Locke’s Mill, Oxford, Maine on January 4, 1869 and his parents moved to Kansas while he was an infant. As a youth he studied and experimented in chemistry, and at the age of 15 was a registered pharmacist. When he was only 17 he taught chemistry. For 20 years he was in business as a druggist in Kansas and when he was 27, he was elected mayor of Fulton, Kansas, where he served two terms. He later served as mayor of Walnut, Kansas before moving to Lake Charles in 1896. He was mayor of Lake Charles from 1929 to 1933. From 1908 to 1916 Leon was a member of the Louisiana legislature, serving as chairman of the committee of education from 1908 to 1912, and chairman of the appropriations committee from 1912 to 1916 in Governor L.E. Hall’s administration. Leon was also active in national politics and in 1908 under the direction of the national democratic committee he delivered speeches around the country on behalf of presidential candidate Williams Jennings Bryan. Mr. Locke was one of the organizers and directors of the National Rivers and Harbors congress and was appointed to its advisory committee. Through this position he was able to serve as the organizing force of the Intracoastal Canal association and it is chiefly through his efforts as its active Vice President that the Louisiana section of the canal was completed. Many historical records refer to him as the Grandfather of the Intracoastal Canal. Mr. Locke served as Mayor of Lake Charles during the difficult years of the depression. According to his handwritten journals, which are in the possession of one of the previous homeowners, often the City was unable to make its payroll and Mr. Locke made these payments from his personal funds. On November 7, 1889, Mr. Locke married Frances E. King. Frances was the daughter of C. A. King, a Methodist minister. They had one daughter, Miriam, who was born in Kansas on March 20, 1892. Leon and Frances Locke loved children and flowers. According to historical reports, they grew some of the most beautiful flowers in Southwest Louisiana. In typical Southern gentleman style of the day, Mr. Locke was rarely seen without his cane and hat. He made many of his canes himself from the orange trees that grew in his yard. The Locke’s were avid readers and had a private library of over 3,000 volumes and it was considered one of the most valuable in the South. It was thought that certain volumes should remain in the home so the current homeowners have some of the Locke’s original library. Mr. Locke was recognized as a scholar of political science and he is the author of an article in the New America Encyclopedia on intercoastal and intracoastal canals. Leon Locke died in his home on April 5, 1934 and his funeral services were in the home on April 6, 1934. Following the news of his death, the flag at city hall was ordered to fly at half mast and all city offices were closed in his memory. Frances K. Locke survived Leon and in her later years was an invalid. During this time, Miriam converted Maison Rouge into a rooming house for single female teachers. Some of these roomers include Ruth Clark Reedy, Iris Murphy, Linnie Lacy, Mable Ross and Dorothy Plauche’. Miriam Locke married Lucius Lemar Moss on May 31, 1949 and they lived in Maison Rouge until their deaths. Mariam died on October 11, 1968 and Lucius died on January 10, 1973. The various relatives of Lucius Moss inherited Maison Rouge and for years it was uninhabited and abandoned. 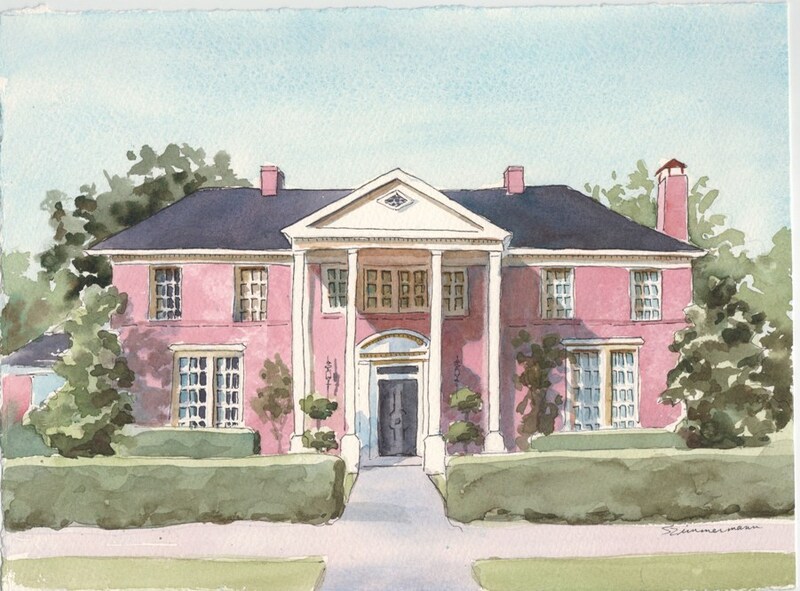 In January, 1975 Blair and Mickey Stoker purchased the home from the legatees of Lucius Moss. They moved into the home with their four young children and began a phase of renovation. Because of the age of their children, the Stokers removed an upstairs outside door and replaced it with a window. The original door is now the front door on the home located at 1515 Griffith Street. Blair Stoker died on February 26, 2001 survived by his spouse, Mickey, and his four children. At the Palm Sunday Home Tour immediately following Blair’s death, Mickey Stoker was overheard telling a friend that she was seriously considering selling her home. The current owners, Jim & Theresa Barnatt, who were looking for a historic home to restore, were contacted and told about this conversation. Through a mutual friend, arrangements were made for the Barnatt’s to purchase the home with the condition that Mickey could carve out a lot to build a home that her husband had designed. The Barnatt’s purchased the home and leased it back to Mickey while her new home was being built next door, 1515 Griffith Street. Jim and Theresa are the ultimate “Do It Yourself” couple. They do the majority of the work themselves on a pay as you go basis. They work when they have the time and the energy so progress is often slow. Over the years they have learned to plumb, wire, float sheetrock, repair plaster, paint and lay tile. And all window treatments were designed and sewn by Theresa. They have contracted only a few projects like a new roof, installation of central air and heat, and the reframing of the front porch. Through the renovation and restoration of Maison Rouge the Barnatts have learned the true meaning of patience and flexibility. While they may prioritize their projects, the house has a way of modifying their list. Old homes have a way of talking to you and helping you decide your projects and how extensive the work should be. The Barnatts are currently in the 10th year of their original 5 year plan. Although there have been times of “blood, sweat and tears” along with the dirt, dust and grime, they envision the restoration as an enjoyable experience. Searching for the perfect piece of furniture at the auction or finding the right size stained glass window have become a part of their everyday lives. The home is built on what was formerly the Perkins family's orange orchard. We believe Leon Locke occasionally visits his old home. Even though all of the trees have been removed, there is often the strong smell of oranges and cigars throughout Maison Rouge. Because the house was built and paid for in cash, there are no records of the architect or builders, but several aspects lead to the supposition that Favrot and Livaudais, a prominent architectural firm at the time the house was built, was the architect. One aspect that supports this theory is the reinforced turnbuckle ties from wall to wall at each floor. Some of the interior walls are approximately 12 inches think in order to accommodate the turnbuckles. This was primarily done in public buildings at the time to prevent destruction by hurricanes, and was a feature of many of Favrot & Livaudais buildings, such as Lake Charles old City Hall and Calcasieu Parish Court House. Another Favrot & Livaudais feature was the use of hand-constructed bell footings which are an aspect of this home that one does not find in residential work of this period. Because Mr. Locke was a prominent man in the community with political leanings, he certainly would have had the means to hire this firm.